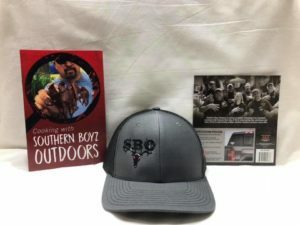 FREE window sticker with a purchase of a SBO Cookbook and Charcoal/ Black Cap side logo with center Black SBO Logo on it. One Size Fits All. I had the honor of hunting and filming my Uncle Gary on a hunt in Missouri this year. Uncle Gary is a 73 year old Veteran that still gets up and goes to work everyday. In his off time he likes spending it with Family, Friends and living the outdoor lifestyle. Uncle Gary has tagged some nice bucks over the years hunting in Louisiana and Mississippi, but never had the opportunity to hunt the Mid-West. I invited him and cousin Brad up to Missouri to make a Rut hunt with me. We had a Awesome time at camp cooking and talking about all the stuff you talk about at deer camp.. Kick back enjoy the hunt. Share it with your friends and leave a comment about your most memorable hunt.